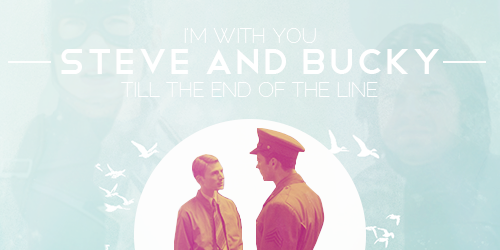 Hello, and welcome to SteveAndBucky, a community dedicated to all things Steve Rogers & Bucky Barnes! This community primarily revolves around a shipping or romantic dynamic between Steve & Bucky, but any and all interpretations of their relationship are welcome for discussion. Tags are your friends! Please use them. Content warnings are advised, encouraged. Not required, but strongly encouraged. Use them as/if you see fit. Please stay on topic - as long as it's related to Steve and/or Bucky (in any 'verse - comics, MCU, etc. ), it can go here. Otherwise, please save it for another comm. Any and all related fanworks (fanart, fanfic, podfic, you name it) are welcome here. Absolutely no ship/character hate will be tolerated. Anyone can post, but please abide by the above guidelines! Lastly, if you have any questions/concerns please feel free to contact me.